Why Are Bad Laws Still Protecting Penn State And Temple? The Penn State defense is so well-practiced, so perfected, that by now you can practically write it yourself. The accusations are unsubstantiated; too much time has passed; nobody remembers; there are no records. The language changes from email to email and statement to statement as the university blasts them out to alumni and supporters, but the logic never changes: The truth will never be known, so why not trust us? Across Pennsylvania, leaders at Temple have become adept at a defense of their own, continuing to insist that there was no problem when a member of their Board of Trustees acted as a lawyer for then-fellow trustee Bill Cosby when Cosby first defended himself from accusations that he drugged and raped Andrea Constand while she was a Temple basketball employee. Last year, Temple spokesman Brandon Lausch said “Mr. [Patrick] O’Connor’s representation of Mr. Cosby was disclosed and vetted in accordance with Board policy.” I reached out to Lausch this week, and he told me the same thing. As of last month, O’Connor was still being quoted as a lawyer for Cosby. Why do so many questions remain about what these institutions knew and when they knew it? In part, it’s because they aren’t required to give many answers beyond what their public relations departments deliver. Penn State and Temple are essentially exempt from Pennsylvania’s public records laws, even though they receive hundreds of millions annually in direct public funding and even though they have done nothing to earn a nearly unrivaled protection from scrutiny. (1) Except as provided in paragraph (4), all information required by Form 990 or an equivalent form, of the United States Department of the Treasury, Internal Revenue Service, entitled the Return of Organization Exempt From Income Tax, regardless of whether the State-related institution is required to file the form by the Federal Government. (2) The salaries of all officers and directors of the State-related institution. (3) The highest 25 salaries paid to employees of the institution that are not included under paragraph (2). (4) The report shall not include information relating to individual donors. That’s all. 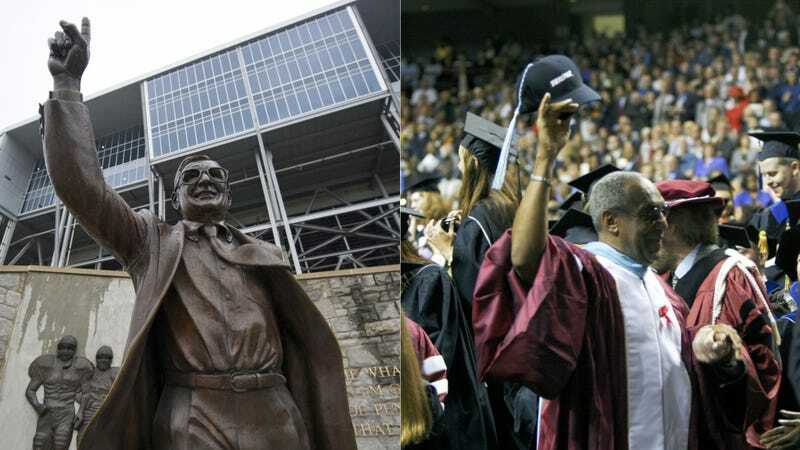 All four universities can withhold pretty much whatever else they like, and they got this special standing with the help of lobbying from Graham Spanier, the former Penn State president ousted in the wake of the Sandusky scandal. Here he was arguing for it in 2007, as recounted by the Pittsburgh Tribune-Review. He cited concerns regarding contract negotiations, donor confidentiality and releasing details of faculty pay—including football coach Joe Paterno’s salary, the subject of a lawsuit before the state Supreme Court. “What we are concerned about is the impact that opening up university salaries would have on Penn State’s ability to compete in a global marketplace for the best faculty and research scientists,” Spanier said. Despite all the horrific revelations over the years—how Sandusky used his charity to groom victims, how Penn State allowed Sandusky to keep using its facilities even after a police investigation in which Sandusky admitted to showering with young boys, the failure to treat what Mike McQueary saw as anything more than a PR problem, the file kept by the then-vice president labeled “Sandusky, Jerry” with the instruction that nobody look in it—Penn State has to release as little information as it had on the day Sandusky was arrested. The administration of Temple University knew nothing of the previously sealed disclosures about Bill Cosby that have appeared in the news media. To our understanding, Mr. Cosby’s deposition was subject to a confidentiality order and only those involved in the case were privy to its contents. While the Penn State scandal did lead to changes in the state’s child abuse laws, bills filed in the following years to try and open up state-related institutions to some sunshine have failed. State lawmakers—the men and women allegedly looking out for the best interests of Pennsylvanians—apparently don’t see anything wrong with granting powers of supreme secrecy to universities that harbored a serial child molester and a man accused of serial sexual assault. Even if the law were changed, it wouldn’t require the universities to suddenly open up the books on everything. Speaking about Sandusky, Melissa Melewsky, media law counsel for the Pennsylvania NewsMedia Association, said Penn State probably would claim an exemption for investigatory records. The reasoning would seem to be that investigations are of critical importance and can’t be interfered with. But granting that requires believing in the quality of the investigations, that the people behind them care about finding the truth and not just what’s convenient or making victims go away. It’s a faith that Penn State and Temple haven’t earned, and that common sense says they must be denied. If any institutions screamed out for public accountability, it would be these two. The statements, the official reports, and the settlements all sound good, but they don’t provide what really matters going forward—assurances that power won’t be abused again.